Even though some say that both evil and demon are mischievous that always wanting to destroy, the truth is between the two is that there is a difference. Demon is always meant to be spirit of evil with the intent of destroying anything while devil is the high-ranking evil spirit, within Abrahamic, monotheistic religions including Christianity. That’s the basic difference pertaining the two. But, the words demon and devil may be used in whatever manner when using it in a wider topic. Take an in-depth look here and see the difference. Christians commonly believe that the devil is actually Satan. According to the Holy Scripture Satan or the devil was originally a rebellious angel who revolted against the Lord God with an army of demons. The consequence will be a condemnation by God. The devil hates all humans and God’s creation itself, and also loves to oppose the Almighty God and the devil has the work of lie-spreading and destroying mankind. An evil spirit that can be referred as a supernatural evil monster. The term itself is definitely not associated with any specific belief system. The use of the word demon depends on the religion and culture because of differences in their beliefs. An example of that will be, the Hindu demon which is called rakshas and the Hebrew word shedim. Demans are usually considered to be lower in rank and they are subordinate to the Devil. In Scripture, Satan or Lucifer is the name of the devil. While “demon” is a word that came from the word daimon, which in Greek means “knowing”. The idea is they are more intellectual than humans. Ancient Greece has a word which means a powerful spirit, that is daimon. The word “demon” itself appeared on 63 instances in the New Testament. A Demon has many titles while the devil only has few, for example in Hebew it is called Asmodeus, in Avestan culture a demon is called Aesma-daeva, and in Islam it is called a Jinn. In the Christian Bible a demon is also called Azazel and Beelzebub. In other religions and belief systems, those names are demons separated from the devil while others state that these names are a semblance of devil. Even when thought of as individual demons, some are often thought of being under the Devil’s direct control. This identifies only those thought of as the devil. The devil is sometimes called Lucifer, particularly when describing him as an angel before his fall, although the reference inIsaiah14:12 to Lucifer, or the Son of the Morning, is a reference to a Babylonian king. Beelzebubis originally the name of a Philistine god (more specifically a certain type of Baal, but is also used in the New Testament as a synonym for Satan. The word Devil is used in reference to the Satan, who belongs to a group of angels called cherubim. (Ezekiel 28:14). But when referring to a high-ranking, stronger demon, the word devil can be used also. The Devil can also be used when referring to a demon that leads a specific group. The Devil has greater evil than demons. It must be remembered that the word daimon together with the word daimonion are both used as singular and plural in the Scripture specifically the New Testament, that’s demons and demon. But never they have been used in a manner that is interchanged with diabolos, the Devil because the fact is, there is only one Devil. In broadest sense Demons act as Satan’s ambassador in order to do his plan to oppose the will of the Lord God Almighty. Satan has limited experiences as a creature because just like humans he is not the Creator, that is why demons extend the power of Satan. The truth is, sometimes it seems like Satan thinks he is omniscient and omnipresent, but actually he is not. The truth is, demons are the one who stretch the power and activity of Satan. Sometimes we are deceived on thinking that Satan does it all (Ephesians 6:11-12). The religious identity of Devil is specific only in some religions like Christianity, Judaism and Islam, on the other hand, demons are broadly being associated with different belief-system. That means only Christianity, Judaism, and Islam has the Devil on their religion. Demons are less mischievous and evil than their superior devil, the reason for that will be the rank of the demons which is lower than devil. Both the Devil and demons are creations of the Sovereign God, created for His purpose on showing His glory in the generations to come after He send His Son Jesus Christ to defeat the Devil once and for all at the Cross. The devil, is identified by the Holy Scripture as the creature personified as a serpent who made convincing effort to tempt Eve on disobeying the Almighty God and eat the fruit which God forbid to eat. While demons are the heavenly hosts created by God originally as angels, then God purposed that those angels rebel and become condemned evil creatures known as demons. Christians regard demons as angels who was fallen because of their rebellion. Sometimes gods and goddesses of other belief systems and cultures are said to be “demons”. The devil is identified as “the old serpent” and “the dragon” in The Revelation of Jesus Christ 12:9, 20:2 and also is identified as Satan. The devil is the person who is the enemy of the elect of God and the Lord God Himself. A high-ranking fallen, reprobate angel who was damned to become an evil creature. He is the superior of the angels who are condemned because of their rebellion. On the other hand, Demon was referred in the New Testament as the devil servant. 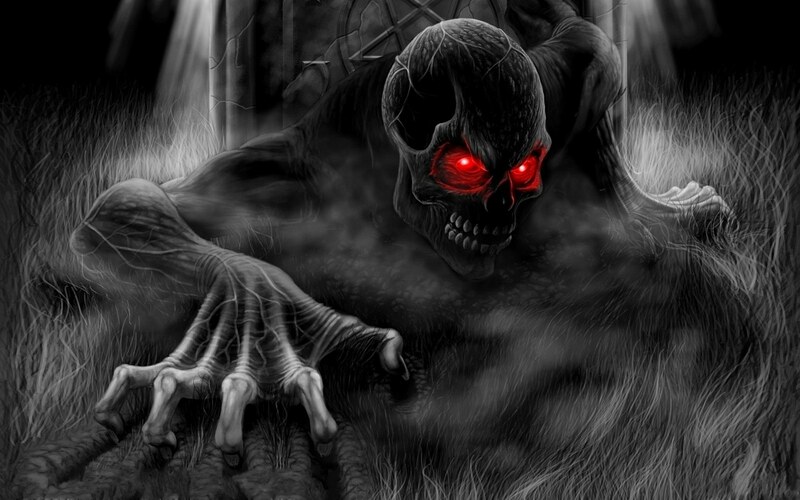 Devil is the supreme spirit of evil while demons are an evil supernatural being. While the term demon is used broadly in religion, literature, mythology, occultism, fiction and folklore. When going back to the original Greek word of demons, we can get the meaning as “knowing” and we can see that it shows that demons are creatures with a higher intellect that mere humans. But this is only a conjecture. In the Bible, the role of the Devil is more broad than the demons. The role of the demons can be seen specifically in writings of the Apostles and Disciples of Jesus in the Gospel, the Gospel of Mark in particular, Jesus is seen casting out a number of demons from those people with different kinds of illnesses. While the Devil’s work is found particularly in the Books of Ezekiel and Revelation, with some quotations of Apostle Paul in some of his Epistles. Scripture states the existence of demons. There are many demons but there is only one Devil. Diabolos, meaning “slanderer” is the equivalent of the term “devil” in Greek language. Used as singular always, this word is associated with devil. While demons are seen as plural when referred in the New Testament when Jesus condemned them. Now, because other English language translation equates the Greek word for “demons” as “devils” the difference may not be implied at first and it makes confuses people. Demons are many but the Devil is only one. In the Holy Scripture, An example of God’s sovereignty even in demons and devil is seen in 1 Samuel 16 and 18 when God sends evil creatures to possess Saul to mete punishment to him because he is not following the instructions of God. It shows God in his sovereignty, commanding and using demons for His purpose to happen. Therefore demons and even the Devil are under the great Authority of the Living God. That is why the people of God is redeemed from the power of these evil creatures and secured in the Hands of the Living God because of what the Lord Jesus Christ has done and is doing right now. Julian Angelo. "Difference Between Devil and Demon." DifferenceBetween.net. November 6, 2018 < http://www.differencebetween.net/miscellaneous/religion-miscellaneous/difference-between-devil-and-demon/ >. “Difference Between Demon and Devil.” Blue Letter Bible. 2018. Web. 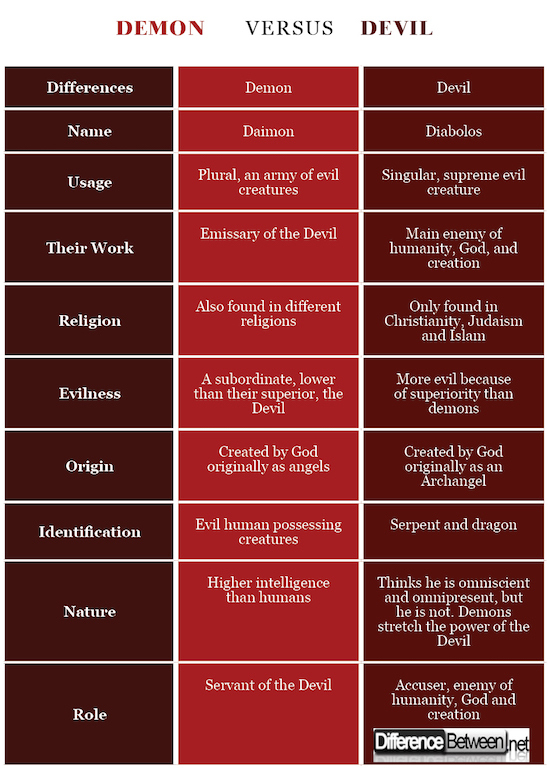 “Difference Between Devil and Demon.” Theopedia. 2018. Web.